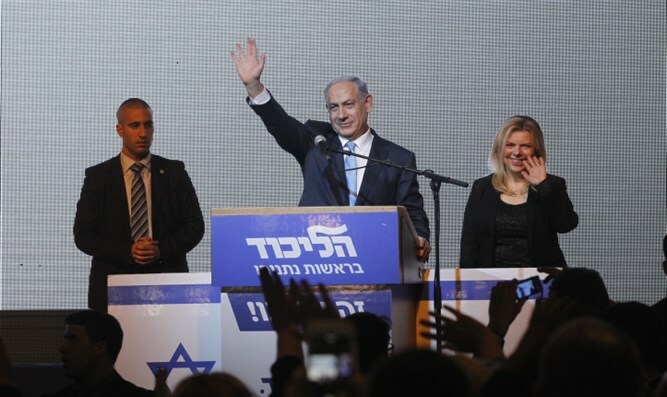 Poll finds Likud would win with 9-seat lead if elections were held today. A poll conducted by the Modiin Institute for News 2 shows that if the elections were held today, the Likud party would win 30 seats. The Yesh Atid party would place second with 21 seats, the Zionist Union would finish third with 13 seats, the Joint Arab List would receive 12 seats, Jewish Home would receive 11 seats, Meretz would receive 7 seats, United Torah Judaism would receive 7 seats, and Kulanu would receive 6 seats. Orly Levy Abekasis, whose recently announced political party does not yet have a name, will win 5 seats, while the Yisrael Beyteinu and Shas parties would barely cross the electoral threshold with four seats each. According to the poll, lists headed by former Shas MK Eli Yishai and former Defense Minister Moshe Ya'alon would not pass the electoral threshold. 36% of respondents said that incumbent Prime Minister Binyamin Netanyahu lis the most qualified candidate to be prime minister. Only 12% think Yesh Atid leader Yair Lapid is best suited for the position. 8% believe that Zionist Union leader Avi Gabai is the most qualified to be prime minister and 6% think Education Minister Naftali Bennett is suitable for the job. A majority of respondents opposed the holding of early elections, with 54% opposing the holding of elections before the current government finishes its term in November 2019. Only 30% of respondents were in favor of holding early elections.